Trolley Scan through their EcoTag® developments have been responsible for rewritting the books as far as operating range versus energising power for UHF passive transponders. With the continual advance of technology, electronic circuitry for operating on the tag uses less and less operating voltage and current with time. However as long as the operating power of the transponder is lower than the RF power available for the tag, the lower operating currents have no impact on improving the sensitivity of the tags as the key performance parameter is the RF operating sensitivity. doubling the range as shown in the diagram means that the area increases by a factor of four for each doubling of the range. 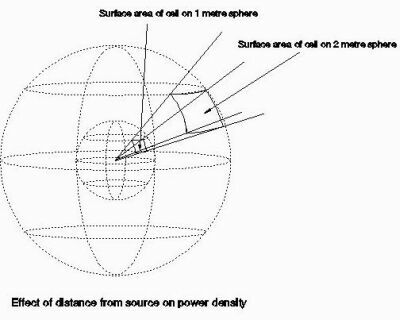 meaning that the power density quarters for each doubling of the range. The energy passing close to the transponder is collected by the transponder in its antenna aperture, an area around the antenna. For a 915MHz dipole antenna system on a tag, the effective collecting aperture of the antenna will be 134sq cms and the impedance of the antenna is 72 ohms. The transponder converts this power received (power density * antenna aperture) to operating energy to operate its circuits. The minimum amount of power needed to operate is called the RF sensitivity of the transponder. Operating range is determined by how far the reader can deliver enough power that can be collected over the aperture of the antenna of the tag/transponder to make the transponder operate. In the 1994 era,state of the art was 5 volt electronic circuitry which when using two schottky diodes in a voltage doubler format attached to a dipole (72 ohm) required 55 MILLIWATTS (RF sensitivity) of RF power falling in its aperture to operate. Since 1994, operating voltages have dropped to 3 volts meaning that a modern transponder would still need 23 MILLIWATTS to operate when attached to a dipole. Trolley Scan have been leading the way in increasing the sensitiviy of transponders. In March 2001 they have announced the availability of a Trolleyponder RFIDmodule transponder made from commercial parts which requires only 1 MILLIWATT to operate and still uses a dipole. In December 2003, Trolley Scan announced the availability of their single chip EcochipTagTM version, which was only 80mm by 33mm in size, and yet operates on just 250 microwatts of energy in its aperture. This uses their new EcoTag patented technology and is available in the small system for users to test. This power is for fully working transponders and is so low on power requirements, that a 100 watt light bulb uses the equivalent power of 400 000 of the new Trolleyponder modules transponder. smaller and simpler reader systems as much less energy is needed to be radiated by the reader, impacting portability of the reader. The above table is based on using a 10 times gain transmit antenna. Below is a graph showing how sensitivity impacts range and energising power. WERP(watts) is the product of the power from the transmitter in the reader multiplied by the gain of the transmit antenna. A matched dipole has a gain of 1.6 and a 6 element Yagi antenna has a gain of 15.